 In Syria, 1.33 million people in 432 hard-to-reach areas and nearly 93,000 others in eight besieged areas received critical UNICEF assistance since January 2017. However, humanitarian access remains extremely challenging in most areas of the country, particularly where conflict is active.  Turkey hosts the highest number of Syrian refugees in the MENA region with more than 3 million people registered, almost half are children. 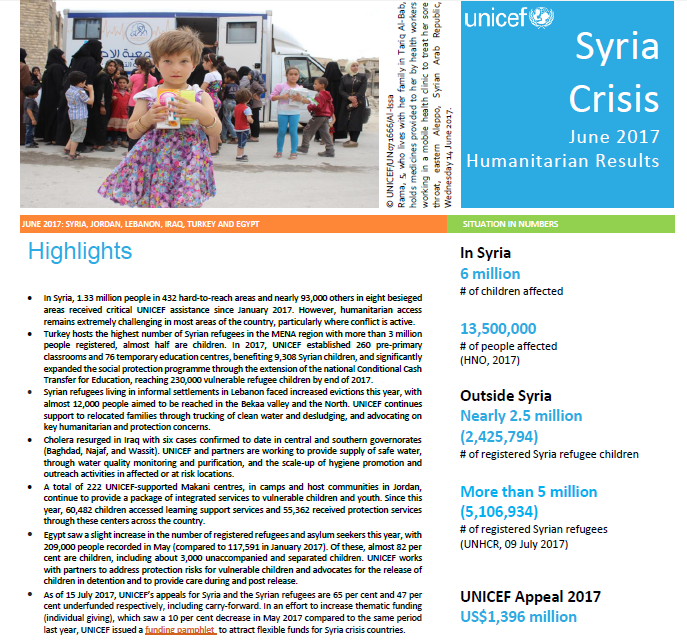 In 2017, UNICEF established 260 pre-primary classrooms and 76 temporary education centres, benefiting 9,308 Syrian children, and significantly expanded the social protection programme through the extension of the national Conditional Cash Transfer for Education, reaching 230,000 vulnerable refugee children by end of 2017.